Do you have questions about school transition services after high school? 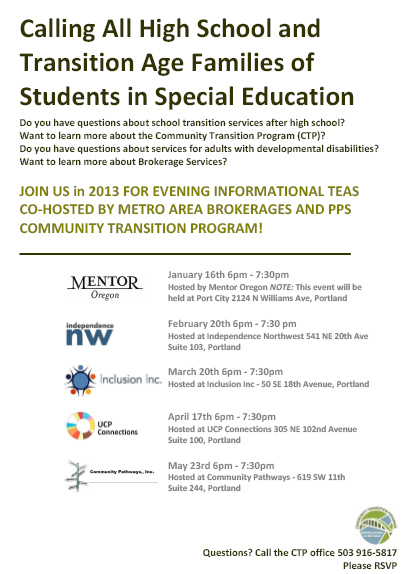 Want to learn more about the Portland Public Schools Community Transition Program? Do you have questions about services for adults with developmental disabilities? Want to learn more about brokerage services? Join PPS and the five Portland metro brokerages in 2013 for an evening informational tea! We’ll do a short presentation on the transition program as well as brokerage services. The evening teas will include light refreshments and tea – and an opportunity for you to meet with PPS and brokerage staff. Get your questions answered and learn more about programs available to young adults in transition. The fourth tea is April 17th. The event will be held at UCP Connections.Please RSVP by calling 503.916.5817. See you there! DRO: Is Your Child Receiving Less Than a Full School Day of Services? Parents of Special Education Students Ages 18 and 19: Is Your Child Receiving Less Than a Full School Day of Services? If you are the parent of a special education student under 20 years of age whose services were cut from a full school day to less than a full school day after he or she turned 18, we would like to hear from you. DRO’s special education attorneys are concerned that a new state policy may allow districts to ignore their legal responsibilities by providing less than a full school day of services for special education students who are 18 and 19 years old. If you believe that your child is being affected by this policy, please call 503-243-2081 to discuss the details of your situation or fill out an on-line intake form. DRO is committed to taking appropriate action if student rights are being violated. 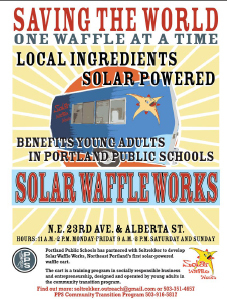 Portland Public Schools has partnered with Soltrekker to develop Solar Waffle Works, NE Portland’s first solar-powered waffle cart. The cart is a training program in a socially responsible business and entrepreneurship, designed and operated by young adults in the community transition program. Hours: 11am – 2pm Monday through Friday | 9am – 3pm Saturday and Sunday. Thanks to Allison Hintzman for the tip. A new solar-powered food cart in Northeast Portland serves up more than waffles. Located at Northeast Alberta Street and 23rd Avenue (map), Solar Waffle Works is a nonprofit project that helps high school graduates gain independent living skills and vocational training. The young adults involved are part of the PPS Community Transition Program, which helps recent graduates transition to life after high school. Corinne Thomas-Kersting, CTP administrator, says Solar Waffle Works benefits students by making them active partners in the creation and management of a socially responsible start-up. Students designed the cart, which is a small blue trailer, from start to finish: They helped create the business plan, the logo, the marketing concepts and the menu, and worked on preparing it for service. They work in the cart preparing and serving food, and assist with accounting and advertising. Hours are 11 a.m. to 2 p.m. Monday through Friday and 9 a.m. to 3 p.m. Saturday and Sunday. Weekday revenue supports the Community Transition Program.The cart is the result of a partnership between PPS and SolTrekker, a Northeast Portland-based nonprofit dedicated to renewable energy education. A solar panel array on the cart’s roof supplies much of its power. In addition to job training, Solar Waffle Works emphasizes the importance of conserving resources and reducing impact on the environment. SolTrekker provided the trailer and added plumbing and solar components. It also contributed labor, funds and materials. Funding also came from PPS and the Spirit Mountain Community Fund. Ty Adams, founder and board chairman of SolTrekker, says his organization didn’t need any convincing to participate. The Community Transition Program helps young adults achieve the greatest degree of independence and quality of life as they transition to life after high school; functions include integrating young adults into the community, increasing their access to social and leisure activities and making appropriate referrals to other services and agencies. The IEP: What Parents Need to Know from 8:45am – 12:00pm on January 30th, with a special session from 12:30pm on Transition to Kindergarten—parents of children transitioning into kindergarten are invited to stay for a more focused look on this important milestone. Need Help at an Upcoming IEP? 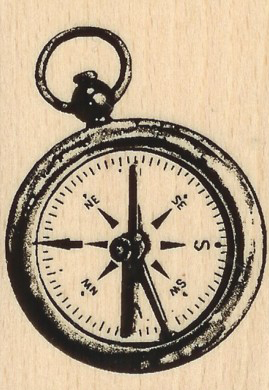 Looking for some assistance with an upcoming IEP for you or your child in transition? OrPTI (Oregon Parent Training and Information Center) ensures that IEP Partners available to families who could use some extra help with the IEP process. The Partners Program trains and matches Partners with parents wanting support at their child’s IEP, Transition or Mediation meeting. Our goal is to have Partners in every community throughout the state of Oregon. Partners are parents and others who have gone through a two day intensive Partner Training Program. Partners are volunteers for the Oregon Parent Training and Information Center (OrPTI). They receive a stipend for each meeting that they attend as assigned by OrPTI. Partners are not at the meeting to speak for you. Their role is to help you prepare for the meeting, plan an agenda, identify the issues, write out proposals etc. At the meeting they will take notes and act as a trained listener who is familiar with special education rules and regulations. Partners model parent/professional partnerships and collaboration. Can I have a Partner attend my meeting? We currently have Partners available in most areas of the state. Due to the great demand, we are only able to provide each parent with a partner for two meetings per student per school year. To have a Partner attend your meeting you need to give the OrPTI as much notice as possible before the meeting (two weeks is preferable). If you call the day before your meeting, we may not be able to make a match, so please plan accordingly. Partners are not always available and we may not have a partner in your area. We continue to hold trainings throughout Oregon in hopes of being able to support parents in all parts of the state. Before a Partner can contact you, a release of information form must be signed and returned to the OrPTI. This form will be provided for you by mail or email which ever you prefer. We would also appreciate you filling out a Partner Evaluation Form, your feedback is important to us, we will use the information you provide to improve this program. To request a Partner please call the Special Education helpline at 1-888-891-6784. IDEA Website – This site was created to provide a “one-stop shop” for resources related to IDEA and its implementing regulations, released on August 3, 2006. It is a “living” website and will change and grow as resources and information become available. When fully implemented, the site will provide searchable versions of IDEA and the regulations, access to cross-referenced content from other laws (e.g., the No Child Left Behind Act (NCLB), the Family Education Rights and Privacy Act (FERPA), etc. ), video clips on selected topics, topic briefs on selected regulations, links to OSEP’s Technical Assistance and Dissemination (TA&D) Network and a Q&A Corner where you can submit questions, and a variety of other information sources. 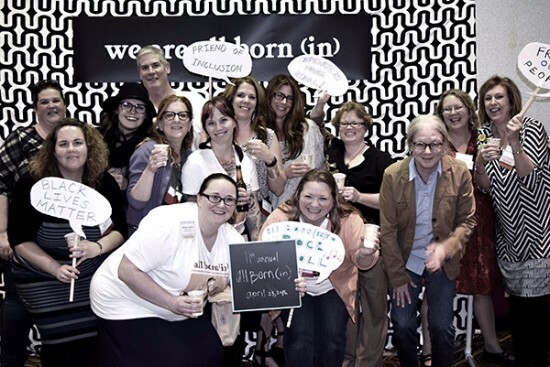 Oregon PTI’s mission is to educate and support parents, families and professionals in building partnerships that meet the needs of children and youth with the full range of disabilities ages birth through twenty six. Oregon PTI provides programs and services throughout the state. Transition Toolbox Newsletter – The Oregon Department of Education and Transition Specialist Jackie Burr invites you to receive the monthly Transition Toolbox! 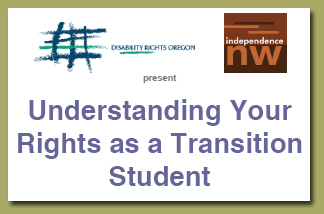 This brief newsletter is designed to facilitate communication and connections statewide with transition specialists, parents and students interested in issues relative to the transition of students with disabilities to college, post secondary education and employment opportunities. Sibling Support Project – The Sibling Support Project is a national effort dedicated to the life-long concerns of brothers and sisters of people who have special health, developmental, or mental health concerns.We believe that disabilities, illness, and mental health issues affect the lives of all family members. Consequently, we want to increase the peer support and information opportunities for brothers and sisters of people with special needs and to increase parents’ and providers’ understanding of sibling issues. Oregon Parental Information and Resource Center – The Oregon Parental Information and Resource Center (OR PIRC) provides resources, information, and skills to educators and parents throughout Oregon, with a focus on Hispanic and low-income families, to create meaningful school-family partnerships for youth success. Technical Assistance Alliance for Parents Centers – Each state is home to at least one parent center. Parent centers serve families of children and young adults from birth to age 22 with all disabilities: physical, cognitive, emotional, and learning. They help families obtain appropriate education and services for their children with disabilities; work to improve education results for all children; train and inform parents and professionals on a variety of topics; resolve problems between families and schools or other agencies; and connect children with disabilities to community resources that address their needs. Wrightslaw – Excellent resource for parents and individuals with disabilities still in school! Parents, educators, advocates, and attorneys come to Wrightslaw for accurate, reliable information about special education law, education law, and advocacy for children with disabilities. Begin your search for information in the Advocacy Libraries and Law Libraries. You will find thousands of articles, cases, and free resources about dozens of topics. For people new to brokerage services, the term independent contractor might be new. If you’re contemplating working with an independent contractor, we’ve created this guide to help you get started. You can check out it out here. OrPTI (Oregon Parent Training and Information Center) presents the 2009 Building Futures Conference this October. Building Futures is for anyone who has an interest in supporting individuals with disabilities as they transition from school to life. This includes Secondary Educators, Post Secondary Educators, Vocational Rehabilitation Counselors, Special Educators, therapists, counselors, service providers, job developers, and other rehabilitation specialists, and especially secondary students with disabilities and their families. Throughout the two-day event there will be presentations by regional and national experts on issues surrounding secondary transition and assistive technology. Check out the agenda here. Scholarship information can be found here. 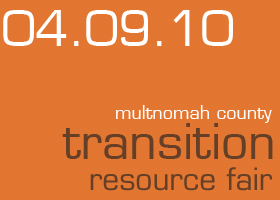 October 26 & 27, 2009 “Building Futures: Statewide Secondary Transition Conference” will be at the Salem Conference Center.